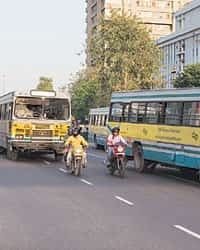 Pune: Bus and truck makers are rushing to meet the specifications of the Delhi Transport Corporation (DTC) which plans to add an estimated 8,000 buses to its fleet before the Commonwealth Games begin in 2010. DTC is likely to spend Rs4,000 crore on the project. Last year, Tata Motors Ltd, India’s largest commercial vehicle maker, won a contract to supply 500 buses to DTC. Ashok Leyland Ltd—the Chennai-based commercial vehicle manufacturer which makes roughly half of the 28,000 buses sold in India annually—is preparing to make a pitch for the order for low-floor and semi-low floor rear-engine buses. Facing competition from the Delhi Metro, and after decades of uncomfortable travel for commuters, DTC has decided to pay some attention to their comfort. So, specifications for the new generation buses include low-floors for easy mounting, rear-engines, better suspension and air-conditioning, all catering to the convenience of the commuter. All this comes at a price and the math works out to approximately Rs50 lakh per bus. Though Ashok Leyland does not have a model that meets DTC’s specifications, the company is planning to showcase a prototype made by Chinese bus manufacturer, Futon, when the second tender opens at the end of the month, a person familiar with the development who did not wish to be identified said. The company is also stepping on the gas for a bus manufacturing plant in north India which will enable it to service emerging markets in the region, the person added. “We have got a prototype made in China for an intra-city application that will be pitched for the DTC order, but as a matter of policy we do not comment on prospective orders," a company spokesperson said. Not to be left behind, truck manufacturer Eicher Motors Ltd is in the process of developing semi-low floor and low-floor buses too. Though it did not bid for the earlier DTC tender, Eicher is prepared to do so now. The company had filed an affidavit in the Delhi High Court on 3 October, maintaining it would be in a position to supply front-engine CNG (compressed natural gas) buses to DTC by February 2008. “No single organization in this country can supply 8,000 buses in three-four years and hence it is bound to be split into potential contenders," an Eicher spokesperson said. The company would develop the semi-low floor bus within the next five-six months and the low-floor bus within the next nine months. DTC wants a total of 11,000 buses on the roads in the next three to four years. Of this, 8,000 will be bought by it at an estimated cost of Rs4,000 crore, while the rest will be provided by a private fleet owner, a person close to the development said. “With pressure now mounting on the government to streamline the Blueline buses, the government will have to fast track the fleet renewal project for DTC," he added. DTC is planning to upgrade its city fleet with a combination of semi- and low-floor, air conditioned and non air-conditioned buses by 2009. Another tender for front engine conventional buses will be for the intra-city bus segment. DTC floated a tender for the supply of these buses last year but cancelled it later for undisclosed reasons. Chandigarh-based coach manufacturer JCBL Ltd, which participated in the first tender, is preparing to quote for the second tender through its new company Cerita Motors, which imports chassis from its Chinese joint venture partner King Long, company director Rishi Aggarwal said. The company recently supplied 20 King Long buses to the Brihan Mumbai Electric Supply and Transport (BEST) undertaking which is currently upgrading its fleet of buses in Mumbai. Tata Motors, meanwhile, has commenced delivery of the first lot of buses to DTC. A spokesperson for commercial and passenger vehicle major Tata Motors said Tata Marcopolo Motors Ltd, the company’s joint venture with Marcopolo S.A. of Brazil, began manufacturing operations in September at the Tata Motors existing facility in Lucknow. A new bus manufacturing facility of Tata Marcopolo—the venture was announced in May 2006—is being set up at Dharwad in Karnataka. The new plant will begin operations in 2008.